What are Amazon Marketplace Ads? Amazon Marketplace Ads are ads that appear when users browse, search, and make purchases on Amazon. Amazon displays these ads when consumers are actively making a buying decision. Thus, making them an attractive tool for advertisers. The pricing model is cost-per-click, so you only pay when an Amazon user clicks on one of your ads. Like Google AdWords, the display of your ads is based on a competitive auction. Sponsored Products ads appear on Amazon's search results pages based on keywords. In other words, when setting up Sponsored Products ads, you select the products you want to promote and the keywords you want to target. You also set a bid. As with Google AdWords, you can use exact match, phrase match, or broad match keywords. The ads can appear above, below, or alongside search results on desktop and below search results on mobile. They can also appear on product details pages on any devices. The ads include the product title, price, product details, and customer reviews. When a user clicks on the ad, they go to the product details page on Amazon. Headline search ads are also keyword based. But, the ad contains three or more products rather than one. The ad displays above search results. When a user clicks on the ad they go to your brand page or to a custom landing page on Amazon. Product Display Ads work differently from the other two types of Amazon Marketplace Ads. The reason is they are based on product or interest data. For example, you can target users searching for a particular product with a product that is complementary or an alternative. When a user clicks on the ad they go to the product detail page. Less competition. Only people who have a relationship with Amazon and currently list products on the platform can run Amazon Marketplace Ads. Ads on Amazon Marketplace are more likely to appear in front of people who are ready to buy than on other platforms. 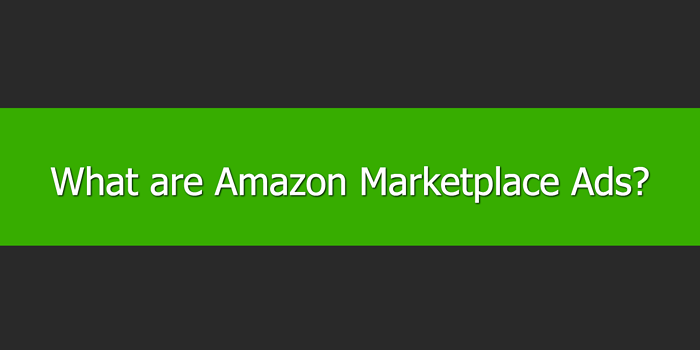 The placement of Amazon Marketplace Ads is visible and well-integrated with organic listings. Amazon Marketplace uses a cost-per-click pricing model for its ad products. Thus, you don't pay for impressions. With all three types of ads, Amazon uses the products you already list on Amazon. This means you need to have a seller account and products on Amazon before you can use Amazon Marketplace Ads. For example, on a Sponsored Products ad, you select the products you want to include in the campaign and how much you want to bid. Amazon populates your ad with the title, image, and price from your existing product listing. When a user clicks on your ad, they go to your product detail page on Amazon. For example, you must list this product on Amazon before you can run marketplace ads. Thus, the quality of the product feed you upload to Amazon is important. This applies to selling on Amazon in general. But, as Amazon uses data for Amazon Marketplace Ads it comes to your product feed. You will get better results when you optimize your data feed. The cost-per-click pricing model of Amazon Marketplace lets you cost effectively test strategies. Plus, you can use data from other advertising platforms to optimize your campaigns. For example, using keywords on Amazon Marketplace Ads that deliver good ROI on other platforms. If you use Amazon to reach new customers, or if Amazon is the only platform you sell through, you should consider using Amazon Marketplace Ads.